"When someone does wrong, whether it is you or me, whether it is mother or father, whether it is the Gold Coast man or the white man, it is like a fisherman casting a net into the water. He keeps only the one or two fish that he needs to feed himself and puts the rest in the water, thinking their lives will go back to normal. No one forgets that they were once captive, even if they are now free. But...you have to let yourself be free." Wow. That quote gives me chills. 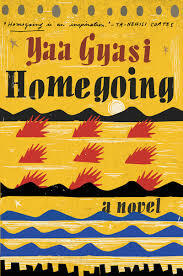 Books like Homegoing are why I read. Gyasi explores deep and painful truths of life and mankind while providing beautifully written passages and the hope of redemption. This story drug me through the gamut of emotions: I was on the verge of tears in one chapter, rejoicing in the next, and ready to throw the book across the room in frustration after that. How can people be capable of such evil? I kept thinking. But also, in the midst of the darkest parts of the characters' lives, someone would choose the harder road, the road of redemption, and I would be asking the opposite: How can man still be capable of good? Of love? And the glowing ember of hope is rekindled. "We believe the one who has the power. He is the one who gets to write the story. So when you study history, you must always ask yourself, Whose story am I missing? Whose voice was suppressed so that this voice would come forth? Once you have figured that out, you must find that story too." The thought that came to mind after I finished the last page, is that I would love to meet Yaa Gyasi and say "thank you." Thank you for doing the research to make this novel resonate, thank you for not sugar-coating the hard topics, thank you for making me ultimately believe in humanity and the hope of redemption at the end, even if it takes generations and journeys across oceans to finally get there.